This is a premium concentrate which can be used in either transfer wheel line marking or spray machines. 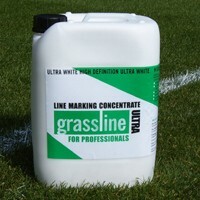 Grassline Ultra produces ultra white lines with strong adhesion and ultra durability. Subsequent overmarking: 1 part concentrate with up to 6 parts water.